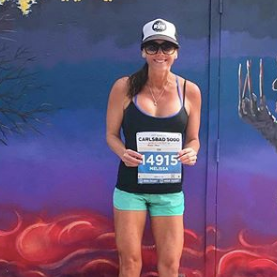 Summer training definitely has it's challenges, and I seem to always pick marathons where the training cycle blazes right through those sizzling, Summer months! One of my biggest things to executing long Summer runs is starting early. It doesn't necessarily mean beating the heat & humidity but it helps to not be running with sun directly overhead. Here are a few things that may seem like common sense, but help me survive a Summer running “Sesh.” (ie: Simplicity/ Essentials / Safety / Hydration). SIMPLICITY: It's hot, make this as easy on yourself as possible. I get asked a lot what I carry, hold and use on the run. As the temps rise and the mileage lengthens, you probably know what I mean when I say that at a certain point into your long run everything and anything can start to piss you off! Hydration packs, running belts, hand held bottles/items, headphones, breathing air...you name it, it all irks you on certain days! I can't run with any kind of hydration pack - feels like running while giving a toddler a piggy back! I live in the back end of a cul de sac and use that to my advantage instead! I set stuff on my driveway like a water/fuel station so I can loop back through depending on when I'll need something, or want to drop something off like excess clothing or gear. It's nice to just be able to run through and grab/drop off what I need and not have to stop. Then you don't have to carry a bunch of extra stuff! Basically, by the end of a long run my driveway looks like a garage sale! 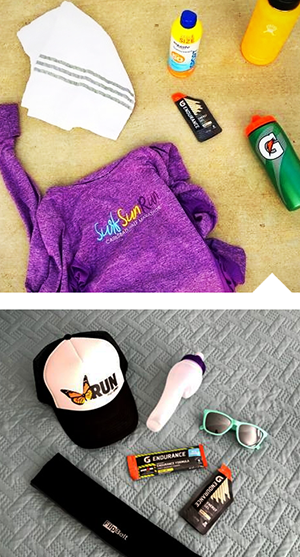 These are my Summer running must haves! Simple Hydration Bottle (the one bottle that doesn't bother me to run with). TIP: I freeze my gels in the Summer! aren't taking in over heated tasting gels! Run in areas that are well lit (I have circled large shopping center parking lots with lights on until day breaks. Start your miles on a treadmill, then hit the road to finish once the sun is up. NO MUSIC! Now, as a runner who runs with music I can say that when I run in the earlier hours I refrain from it. You need to be extra cautious of your surroundings and able to hear anything concerning. Watch for snakes, coyotes and other animals and humans – I typically carry some type of weapon on my runs, it differs depending on the terrain/area I will be in. HYDRATE: You have to stay on top of hydration during these extra sweaty months to avoid headaches and dehydration. I'm someone who hydrates quite a bit throughout the day, so I don't typically need to take in much on the run, unless it's extremely high temps or 10 or more miles. You should be drinking about half your body weight in ounces of water each day. (For example, if you weigh 200 lbs, aim for around 100 ounces of water a day). Make sure that if you are racing in the Summer, you are practicing your race nutrition on your training runs. Summer running is far more cruel and heat can cause excess cramping and nausea that you otherwise may not experience in Fall or Winter months. You want what you are taking in to help, not make matters worse. If you train smart, you can come out of Summer running so strong. Pushing through the heated months is typically what sculpts the next few months of racing PRs once the temps drop. Most importantly listen to your body! Be smart, if it's too hot or you just aren't feeling right, call it and try again another day. No harm in taking care of yourself. Hydrate and hang tight my friends, it's gonna be a hot one!